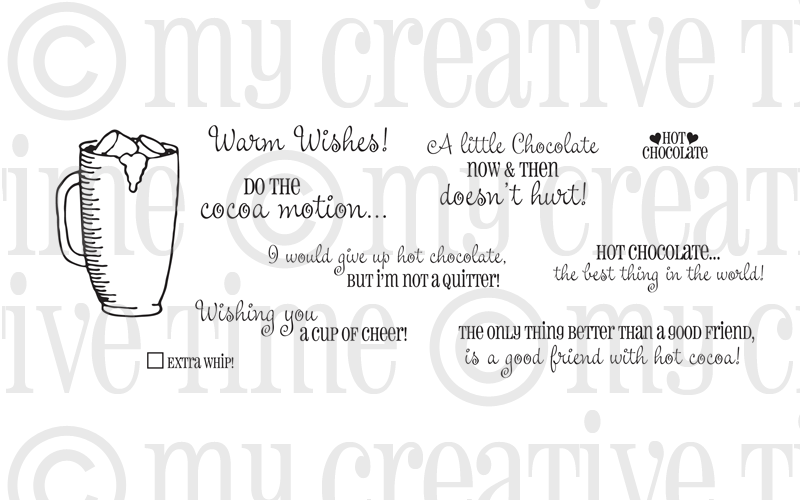 My Creative Time: MCT March Stamp Release "Cocoa Motion"
GOOD MORNING my Creative friends! 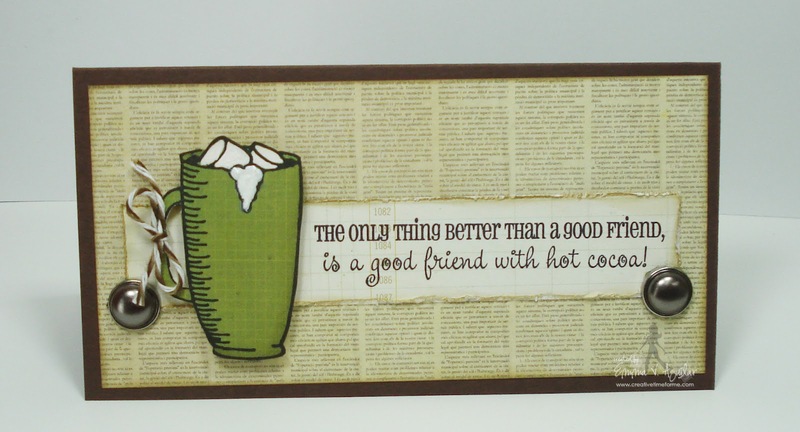 How many Hot Chocolate/Cocoa lovers do we have out there? "I" for one, LOVES my hot chocolate WITH extra whip! I don't know about you, but the can whip is good, but there is NOTHING like making it fresh from the little carton "Heavy Whipping Cream"! I LOVE to make fresh whip cream for my hot chocolate /cocoa & you can't forget the mini marshmellows & I always top mine off w/a sprinkle of cinnamon! YUMMO! I am just LOVING this stamp set to pieces & ESPECIALLY the name of it: "Do The Cocoa Motion"! How cute is that??? I think my friend hit it right on the money w/her CUTE hand drawn cup filled w/cocoa, marshmellows & WHIP for this stamp set! I used chocolate brown cardstock from Papertry Ink & all the pattern paper is from Echo Park's "Charming" 6x6 pad! I decided to paper piece this image just like I did yesterday! If you missed my video on "Paper piecing", you can see it HERE! You all know that I LOVE to do giveaway for my new releases!!! I will randomly pick & announce all winners on Friday, March 16th during the blog hop/ linky par-TEA happening @ 12:01am PST in my video! GOOD LUCK! I like all these cards. Haven't tried them yet but I think I'll enjoy doing cards like these. For me, they are no different than scrapbooks. And oh by the way, the best card from me is from Mrs. Kim. Wow Emma what a cute card...I love watching your thought process as you design your card....love the tip too about cutting the prongs off of a brad..never thought of doing that you are a very clever gal. Love your new stamps too and can't wait to receive mine. I'm so excited to get my set! Love this to pieces! I love the card (the mug is my favourite part, green is my favourite color). the background paper is really cool! DT did yet again another great job. I did see you featured on the My Craft Channel, very cool congrats!! Awesome set Emma!! I just love your card and the DT did an amazing job! And I love Hot Cocoa with whip!!!! Have a great day!!! Emma beautiful card! I love your creativity, it's simple yet so pretty!!! you definitely have that special touch for crafting. TFS and I can't wait to get my stamps! 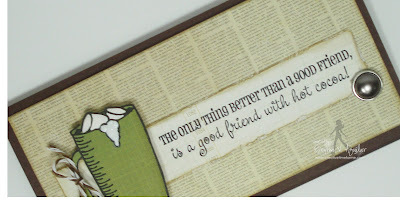 Very cute simple card...and I am loving that paper!! What an awesome card Emma!! Totally see why this release is a favorite! I love it!! You and your DT are rocking these!!! TFS and congrats on being featured on the My Craft Channel!! Another great day of wonderful projects! Emma ~ Oh that is seriously so PRETTY! The twine wrapped around the handle is to CUTE! GORGEOUS paper used as well! I have to say I think you touched EVERY "HOT' beverage drinker with this stamps releasE! It might be my ALL time FAVORTIE! Okay I say that EVERY release but it has endless possibilities! Cute card! I don't care for the taste of coffee or tea, but give me hot cocoa any day. Great stamp set. Awesome cards! I really need to get this set of stamps. Wow, amazing projects from all of you again. You are all so talented. OMG Emma! LOVE IT! 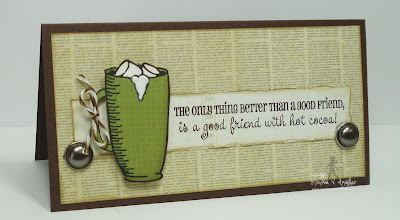 I am a huuuuuuge chocolate lover, but I have never tried hot cocoa with "all" the fixings you add, might have to give it a try ;) I love mine with marshmallows and your stamp set is ADORABLE all the projects are-as usual- fantastic! 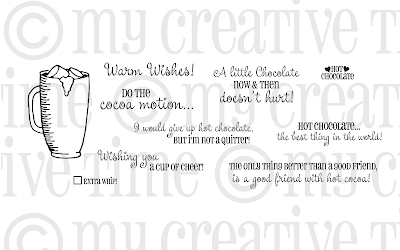 Thank you for sharing both, your recipe and the card, love the theme "cocoa motion"
Love the Cocoa card. Waiting for my coffee stamp set of yours. Can't wait for that. I love the "drink stamps," non-alcoholic, of course. Your designs are very original and different than others. Love your site. As always you did a wonderful job. Thank you for sharing all your wonderful ideas! Emma once again your card is adorable just like you are! I so enjoy your videos and I love love love this set! I can't wait to get mine. 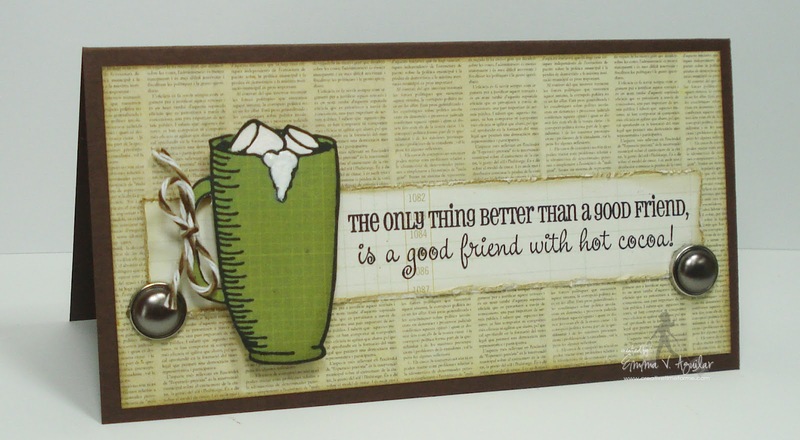 I love this hot chocolate one as you know I love me some Starbucks hot chocolate! I love the sentiments they are super cute. Now going to visit the DT! Can't wait to get my bundle in the mail, these stamps are soooo cute! Love your card and the DT members too. So super cute & fun. Congrats Emma for coming out with a other amazing stamp set that is for everyone & everything. Emma, This is your best release yet! Your card and DT projects are so incredible! You go girl, thank you for such AWESOME inspiration and AMAZING stamps! This is my favorite release so far...cant wait to get my order! Love all the ideas from you and your team..AWSOME!!!!!!! Your design team is awsome. I can't choose a favorite card. I love them all. Great set! I am off to check out the fun things the designers made and to check out your feature on the craft channel! Congratulations! Wow!! Another great job by everyone!!! Love this set!! These are too cute!!! This set is being placed on my wishlist for sure!! WOW! I love your card Emma and your design team's projects are amazing! Love the new sets! Thanks for sharing and have a wonderful day! Congratulations Girl! I just wanted to say thanks again for make a stamp set I can use for the hubby. He’s the cocoa lover and I’m the coffee lover. So I can create for him and myself. Great card its simple but will go good for a man or woman. Thanks for the chance to win. Hi Emma:) love these stamps that I had to get me the coffee and die set!! Congrats being featured on The Craft Channel!! Congratulations on being featured on the Craft Channel...Wow! You and your team rocked the stamp set today...what great projects. I am so amzed at all the geat ideas for just one stamp. thanks for all the wonderful creations. LOVE your card Emma! And your toppings for hot chocolate sound reeeeaaalllllyyy good! I wish I had the ingredients! Love that there is a hot cocoa set. I love these stamps! Thanks again! Emma, I made the rounds of all the design team projects and as usual they out did themselves. They are all so creative and talented. Love your card. The idea of cutting off the prongs was great. I don't like having them come through the back of my project. Can't wait until Friday and thanks for the chance to win. Cute stamps I love that mug, thanks for sharing and I love all the projects that your DT did!!!! Oh YUM, I love hot cocoa, especially with extra whip. Sometimes I eat it all and add a second helping. This set is just adorable. Great card--thanks for making this set. I don't drink coffee and tea only occasionally but love hot cocoa in the winter. So cute and what a great release!! Great job DT!!!! You all rocked this!!! Love the different styles and different looks. And Emma...once again..way to go on the paper piecing. Love that technique..totally gives it more dimension and and gives it that extra special touch!!! Great projects by everyone! I do love Hot Chocolate oh so much! Fabulous set. Love the card and especially this stamp set! So cute! Wow, I am SO loving these projects!! And can't get over how cute the stamp set name is!!! Such awesome projects. I love the stamp set, my kids and I love hot chocolate so this perfect for us, it will be at the top of my wish list! Great card love how you made it a rectangle. Cute & fun new set! p.s. I like Butterscotch Schnapps in my Hot Chocolate--yummy! I love your design team....whooooo hooooo! Amazing job by everyone. You girls are the best. Love your card and yes I love hot chocolate and marshmallows. One of my favorite treats bar none. Love what you are doing here will be back again soon! Amazing my friend! Another wonderful release and just perfect for this time of year! Thanks for all of the crafty inspiration your design team is amazing!!! Fabulous cards for fabulous stamps! I just love all your stamp designs! I would love to have them all! Love your card, Emma! We were totally on the same wavelength with our colors today!!! Congratulations Emma!!! I am so happy for you!! Love the new release it is BRILLIANT! Everyone did a wonderful job! Thanks for sharing. Perfect idea for Operation Write Home cards! Thank you for sharing! Very cute set and designs!!! Wow -- what perfect stamps you made again. I love all the tea, coco, and coffee cards/projects. Great job. Wow the stamps are awesome and so are the creations, the design team is always amazing! TFS. Emma, Love your new release!!! Great Job, love seeing all the great ideas from your team!!! Emma, what a great idea!!! and the cup card is way to cute!!! Your DT also did a great job, as always. Thank you for a great week of inspiration.